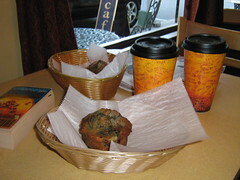 In my most perfect dreams of what every morning would be, I'd have blueberry muffins & lattes with my husband at Cafe Azafran in Lewes, De. They happen to also make a kickass red velvet cake. Srsly. Alas, this morning, I've only got the coffee. But, it's good coffee & will do the job. That's all for now maybe I'll c-ya later on Twitter. Make it a phenom day!